Meet Cassidy. With her embarrassing dad, pregnant mum, loser brother and knicker-chewing dog, she's almost invisible in her family. So she's hoping Year 7 is her time to shine, especially since a test proved she's Gifted & Talented. The only problem is she picked her answers at random. But surely the school wouldn't make a mistake about her genius? Review: I absolutely flew through this book, it is most definitely a must-read for anyone who has children starting secondary school in the next couple of years or any child who is in that position. This book is full of humour but also real messages about friendship, growing up and self confidence. I'm already looking forward to the next instalment! I read this book with some children at school who are about to begin that journey to secondary school and they thought this book was hilarious as well as lots of good fun, It also provoked some interesting discussions about friendships and not giving in to what other people think are cool. For the adults out there, it also led to some interesting discussion about parents and their relationships with children surrounding mutual respect and responsibility. I really loved Cassidy as a character. 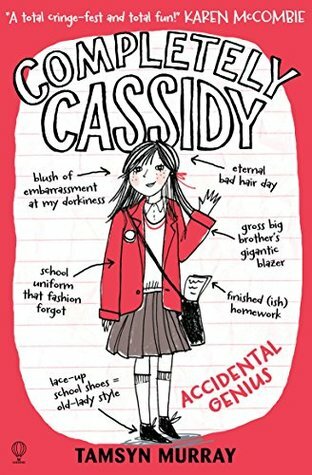 She reminded me of a cross between Harriet Manners (Geek Girl) and Darcy Burdock and that was the kind of feel that this book had to it as well! She is a little bit overwhelmed by secondary school, the routines and the people and she's a little bit unsure of changes that are going on at home as well so she's really at a total crossroads in her life. She doesn't let that get her down though and attacks everything that she does completely head on-i loved her for this! her older brother and her parents provide comedy sidekicks to her sometimes as well. 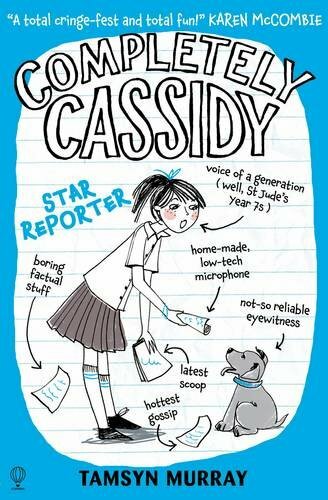 Cassidy's friends are typical eleven year-old girls and |I can't wait to catch up with them in the new book as well. There are some real cringe-worthy moments in the book where you think to yourself, how did you actually get yourself into these scrapes? Some of these involve a very cute chocolate lab named Rolo of course! Overall this was just a really fun read and a real refreshing change from novels set in other countries with children starting out in the next stage of their education. In case I haven't said it enough already-this was great but now I can't wait for the next one book in this series!